Amazon.com is likely to be a chief beneficiary of the online shopping boom. After getting off to a somewhat slow start amid the fog of a contentious presidential election, online shopping surged strongly during the holiday season, with Adobe reporting Thursday that retailers pulled down some $91.7 billion in digital sales. That haul represents an 11 percent increase over last year and surpassed Adobe’s earlier projections for the season by $115 million. The company’s report is based on an analysis of 24.6 billion visits to shopping websites. Adobe’s software powers many retail sites. The strong growth in online spending reflects a long-term shift in which shoppers are choosing the convenience of swiping, tapping, and clicking over a trip to the mall. Indeed, in-store analytics tracker RetailNext reported Thursday that mall traffic sank 12.3 percent in November and December, while sales dropped 9.9 percent. While consumers for years have been demonstrating a growing willingness to shop on their phones, this holiday season put into sharp relief just how integral the small screen has become in the buying experience. Adobe reports that mobile devices, which include tablets and smartphones, accounted for 50 percent of visits to retailers’ websites during the holidays. Purchases made on these gadgets added up to $28.43 billion in revenue, a 23 percent increase over last year. 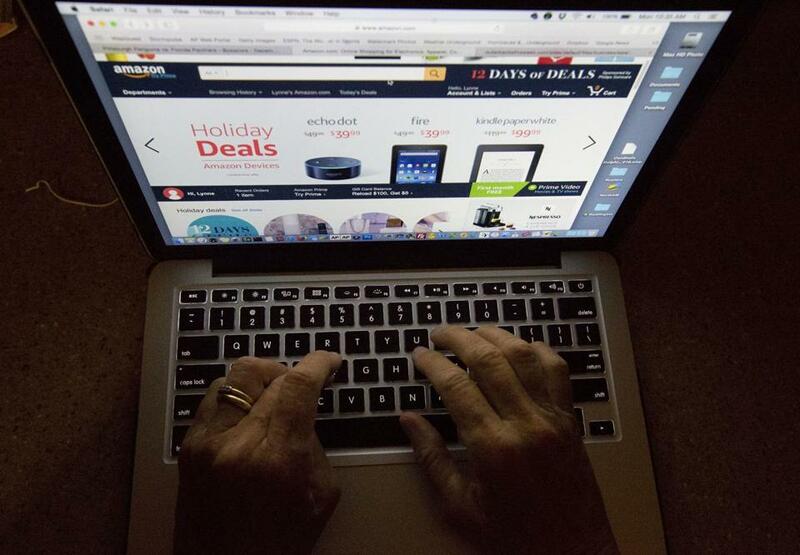 Amazon.com is likely to be a chief beneficiary of this online shopping boom. Slice Intelligence, an e-commerce research firm, reports that Amazon captured some 38 percent of the dollars spent online between Nov. 1 and Dec. 29. No retailer came close to matching its dominance: Best Buy grabbed the next-largest piece of the online pie, drawing 3.9 percent of overall online spending. Target earned 2.7 percent during that period, while Walmart grabbed 2.6 percent. Amazon has offered at least one hint that it saw robust sales in the season. The company said this week it experienced a 50 percent increase during the holiday season in items shipped via its ‘‘Fulfillment by Amazon’’ program, in which Amazon packs and ships products being sold by third-party sellers in its marketplace. For several major retailers that rely on brick-and-mortar stores for the bulk of their sales, the holiday season hasn’t shaped up as merrily. Macy’s reported Wednesday that it saw a 2.7 percent dip in comparable sales, a measure of sales online and at stores open more than a year. The retailer is poised to close 100 stores and slash 10,000 jobs to help it get on better footing. Kohl’s reported a 2.1 percent drop in comparable sales, saying it saw great variance in shopper spending throughout the season. Shoppers hit up the department store chain in droves on Black Friday and the final days before Christmas but weren’t spending big in early November or early December. Many major retailers have yet to report how they fared during the holiday rush. But expectations heading into the season suggested that Amazon and mid-sized retailers such as Bonobos or Warby Parker would steal market share from the some of the biggest names at the mall.